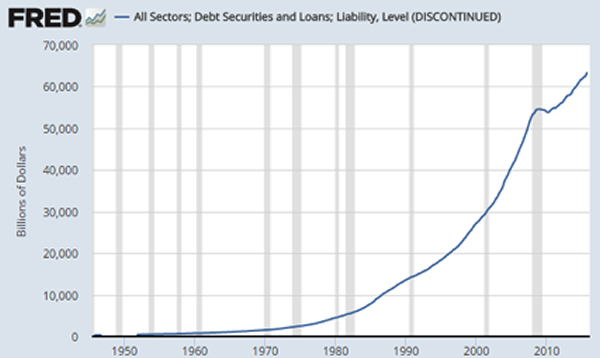 „We are now living through the mother of all financial bubbles. We’ve been living with it so long now that we have to take three giant steps backwards to even detect its broad outlines. As a reminder, a bubble exists when asset prices rise beyond what incomes can sustain. Florida swampland in the 1920’s, tech stocks in the late 1990s, or Toronto real estate today — all are fine examples of this. Now, regular readers of PeakProsperity.com’s reports will know there’s a mountain of evidence contracting this. But it’s critical to understand that this is the same public perception management style as we’ve recently seen at Oroville: Deny, deny, deny… and then finally admit the obvious. This is such an easy concept that I’m continually surprised at how poorly appreciated it is and how much resistance it receives when raised. But it works like this: the earth is a sphere and therefore has a defined surface area and a defined amount of resources available for use. After a while, though, all that feel-good activity is revealed as a fraud. It turns out prosperity wasn’t printed, instead it was redistributed. From one party’s pocket into another. And in most cases, from poorer pockets into those of the already-privileged. The same is happening today with the “thin air” money printing being conducted by the world’s central banks. We are now living with one of the most extreme wealth gaps in US history, with the top 1% (really, the top 0.1%) owning a greater percentage of the nation’s wealth than they ever have. 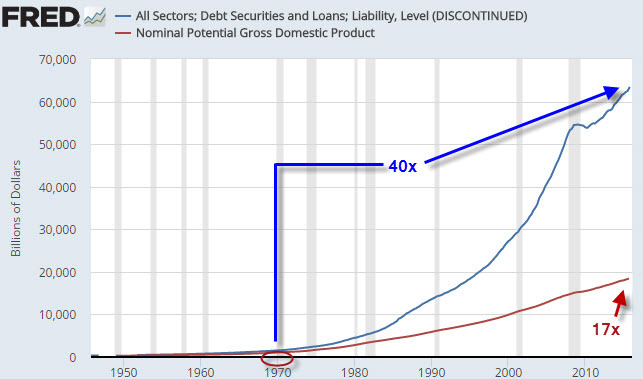 But it’s even more nefarious than that, because the Fed is not simply stealing from today’s public; it is also stealing the prosperity of future generations. When the party being stolen from hasn’t been born yet, it can’t fight back. In short, you cannot print your way to prosperity. Yet somehow we’ve forgotten that. And we’re dooming ourselves (and our children and grandchildren) to becoming serfs in the process. This, too, should be completely obvious. You know perfectly well it holds true for your personal life or your business, if you have one. And it’s equally true for a nation, which is simply an aggregation of individuals and businesses. But somehow this simple truth has been either forgotten or deliberately ignored by today’s economists and politicians. 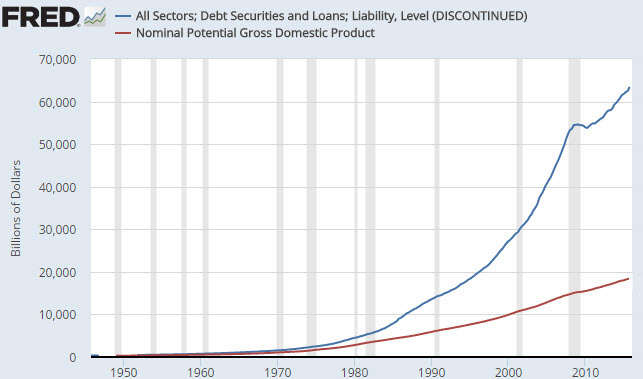 Our grand experiment in debt-based fiat currency — unbacked by anything tangible, like gold — began on August 15th, 1971 when Nixon unilaterally broke the Bretton Woods agreement and forced the entire world off of the gold standard. Not that the world minded much, because this then meant that politicians and monetary hacks everywhere could ignore centuries of economic lessons and begin making exorbitant promises by printing currency like mad. But the Federal Reserve, under the leadership of a pure academic like Janet Yellen, cannot conceive of any approach other than perpetuation the same system that has been in place while she’s built her career. The Fed has printed as much money as it has dared for the time being. It has since handed the baton over the ECB, and the Bank of Japan, who have stepped in to keep the wheels of the world’s debt production well-greased. Around and around the baton gets passed. And we’re told by our government and media that this is all in our best interests. However, the only thing these central banks are truly doing is stealing from savers and the elderly today, and pretty much everyone tomorrow. What have they done with the trillions in “thin air” currency they have printed up? They handed them to the big banks, to speculators and the already wealthy. Which should come as little surprise. These are the people they count on for their high-status jobs, as well as the big payouts awaiting them when they return to the private sector. You simply cannot count on anyone in power giving you anything like timely warning or useful advice in advance. You need to find accurate, trustworthy indicators on your own, and then decide how you’re going to position yourself, your loved ones, and your wealth accordingly.